The city of Seattle ranks in the top 10 for a slew of goods and services: bread, sugar, cooking oil, telephone service, gasoline, dental visits, wine, frozen corn — even tennis balls. 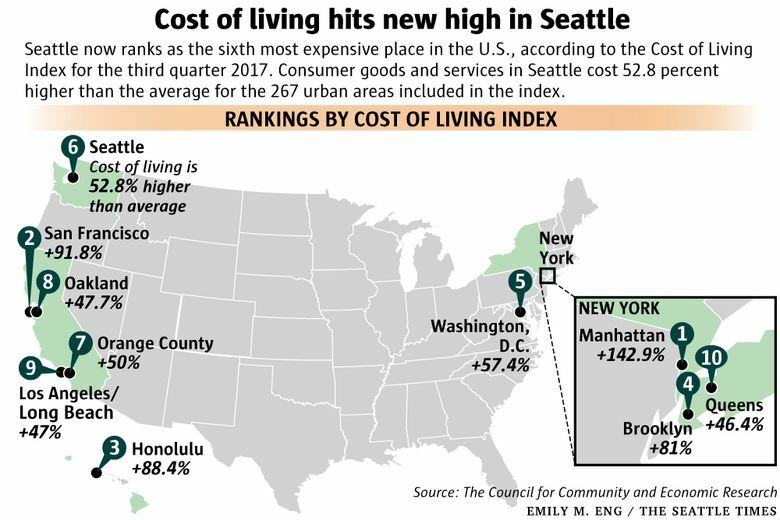 It’s not just housing that’s driving the high cost of living in Seattle. Everything is expensive here. That point is hammered home in the latest release of the Cost of Living Index. Seattle hit a record-high score of 152.8 for the third quarter of 2017, which means that it costs 52.8 percent more to live here than the average for the 267 places included in the survey. With that score, Seattle ranks as the sixth most expensive place in the U.S. to live, also a record for the city. Seattle first appeared in the top 10 in 2016, and has now spent three consecutive quarters on that list. 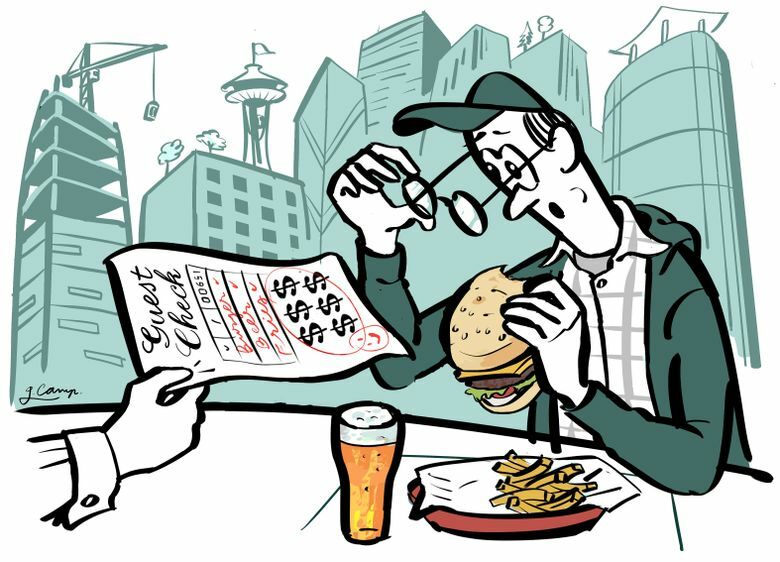 Seattle’s rise has even caught the eye of the folks who produce the Cost of Living Index. The Cost of Living Index, which has produced these city-to-city cost comparisons since 1968, collects data on prices for more than 60 goods and services. These are grouped into six major categories: housing, health care, transportation, utilities, grocery items and miscellaneous goods and services. 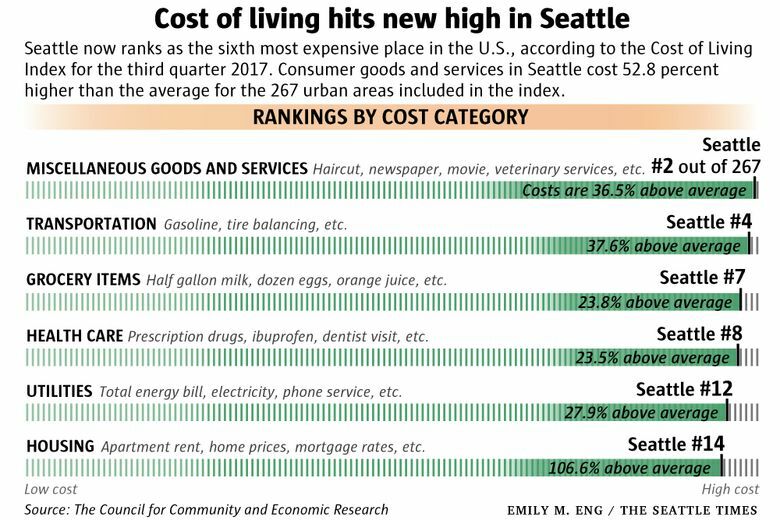 And here’s the kicker: Of those six categories, housing costs is where Seattle ranks the lowest. We place 14th out of 267 cities for the housing index, which is calculated from a combination of both home-ownership costs and apartment rents. While 14th is high, we’re in the top 10 for all the other categories except utilities, for which we rank 12th. That said, our index score for housing is 206.6, which is the highest of any category. That score means that housing in Seattle is 106.6 percent higher than average, or slightly more than double. You’d think housing costs like that would rank us higher than 14th. The reason it doesn’t is because there are a bunch of other places with even crazier home and rental markets than ours, including various parts of New York City, California, the Washington, D.C., area and Honolulu. In Manhattan, housing costs are more than five times higher than average. But Seattle is the most expensive city in the country for a number of survey items, including hamburgers, dry cleaning and haircuts, which average $31 here (compare that with Harlingen, Tex., where a visit to the barber will set you back just $6, on average). We rank in the top 10 for a slew of others, including T-bone steak, bread, sugar, cooking oil, telephone service, gasoline, dental visits, beer, wine, frozen corn — even tennis balls. Apartment rent is also in the top 10, unsurprisingly. There are still some bargains to be had here, but it’s a very short list. We have the ninth-lowest price for potatoes, and the 10th-best mortgage rates (for the lucky few who can afford to buy a house). The items included in the survey may seem to have a randomness about them, but they are meant to be indicators of broader consumer costs, Allison says. For example, if it costs a lot more than average to get your car tires balanced in your city, it follows that other automobile maintenance and repair services are probably also on the expensive side. In Seattle, tire balancing averages $69, which ranks fourth highest. All the researchers in each location collect their data during the same three-day period each quarter. They’re not hunting for bargains, either. Researchers are instructed to scout for prices with the mindset of a person in a professional or managerial occupation. The Cost of Living Index has remained remarkably consistent over its 50-year history, but some changes are planned moving forward. Landline telephones, which have been included in the survey since the start, will be replaced with local wireless taxes and fees. There’s one more major change being made for 2018. Bowling will be retired from the survey. “We’ll be pricing yoga instead,” Allison said. Correction: A previous version of this story incorrectly stated that T-bone steaks were more expensive in Seattle than in any other U.S. city. Cleveland holds the most-expensive-steak title, and Seattle is second.